This context-sensitive, mixed-use redevelopment of a former lumberyard provides new housing, retail, public spaces, and parking all within a short walk of the PATCO train station in downtown Collingswood. 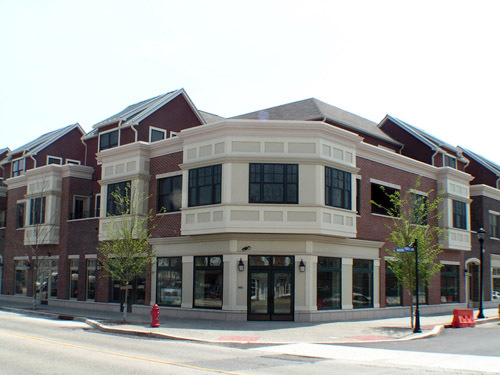 It has been a crucial component of the borough’s efforts to revive its town center. The LumberYard Condominiums will add new vitality to the downtown of the Borough of Collingswood in Camden County with several hundred new residents (120 residential condos) and strengthen the business district with new storefronts (21 retail condominiums) and a new underground parking garage for public and private use (376). Once completed, the development will also feature an outdoor plaza for gatherings, entertainment, and street fairs. The project takes advantage of the borough’s historic buildings and an urban fabric of streets at a walkable scale. The local planning board and the historic commission have been deeply involved in the design and selection of materials to insure that new buildings are integrated with the existing architecture. The project is the culmination of years of planning. In the 1970s and 1980s, business owners and elected officials started to try to counteract Collingswood’s declining commercial and residential center through public investment in urban redevelopment, specifically in streetscape renovations and the rehabilitation of struggling properties. These successful initiatives helped garner wide public support. The Borough of Collingswood also undertook various large-scale planning efforts, among them a state-funded Smart Growth study, which culminated in a master plan that supported the creation of redevelopment areas to maximize one of the community’s biggest assets: the PATCO high-speed commuter rail line to Philadelphia. Ideal for this purpose was the former site of Peter Lumber, which had been vacant since 1993. In addition to the LumberYard Condominiums, plans call for transit village development around the PATCO train station. Once it had identified the need for a transit-oriented site, which enhances Collingswood’s Transit Village designation, the borough had the vision and courage to become the developer of its first project. In taking this role, the community was able to ensure the density needed to make the project economically feasible while respecting the scale and character of Collingswood’s main street, Haddon Avenue. The local government and nearly 300 community residents were involved in the planning and design of the LumberYard Condominiums through a series of town meetings and planning charrettes. The town’s overall response has been very positive, and every commercial and residential space is sold for the first completed building. The project, which will be finished by the fall of 2008, stands out as a successful partnership between a public entity and design professionals, who cooperated to make the LumberYard Condominiums economically viable and aesthetically pleasing. Collingswood’s first major development since the 1940’s, the project has already encouraged an arts and entertainment resurgence in the downtown, which has served as an economic engine for the borough.